A recurrent BCC on the lateral nasal sidewall and medial canthal region is marked for excision. It involved the eyelids and canthal apparatus. Excision removed the medial orbital wall and nasolacrimal duct. A transnasal canthopexy was used to hold the eyelids in position along with a flap from the forehead to reconstruct the defect following excision. BCCs rarely metastasise and grow slowly. However if left they will slowly erode through adjacent tissue leaving a fungating ulcer. They are related to sun exposure over time. There are several clinical types of BCC and treatment varies accordingly. SCCs may metastasise and those on the lower lip are particularly dangerous. They are also related to sun exposure but also to various chemicals and chronic trauma. They require a wider margin of excision than BCCs. Melanoma has a high mortality in New Zealand. It may occur on any part of the body including non sun-exposed regions. Prognosis is related to depth of the tumour. The margin of excision depends on the tumour depth. Once a melanoma is diagnosed, the Plastic Surgeon will perform a wide local excision which involves a wider margin and greater depth of excision. In some cases a sentinel node biopsy is performed to examine the draining lymph nodes. Regular periodic examination of the draining lymph nodes is important for up to ten years following a melanoma. 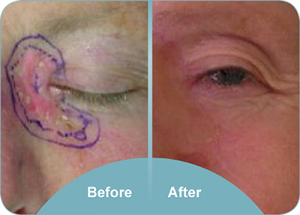 The role of the plastic surgeon is diagnosis of the tumour and appropriate treatment which may include surgery. Plastic Surgeons are especially involved in excision and reconstruction of difficult defects particularly in cosmetically sensitive areas.